Have you ever wondered what happens after you pass? If there’s a heaven? 90 Minutes in Heaven is about Pastor Don Piper’s experience. He was on his way from a conference, driving home as many of us do everyday from work. When a semi-truck crossed the line and hit him head on. The first responders to the seen pronounced Pastor Piper dead at the scene. But that didn’t stop a friend, a minister, from praying for him. During those 90 minutes, that his body laid under a tarp on the accident site, Pastor Piper claims to have experienced heaven. He was peaceful and happy. Then all of a sudden he was back on Earth and a live. 90 Minutes in Heaven is a true story about Pastor Don Piper’s life starting on the day he was in a head on collision with a semi-truck. It’s an amazing story. For anyone who is on the fence, or is struggling with their faith, needs to read this book. Heaven does exist. So many have read 90 Minutes in Heaven that it has now been adapted for the big screen. Opening in theaters on September 11th you will be able to see the pains and struggles that Don and his family went through after his accident. It’s a touching story. I was able to watch a trailer for 90 Minutes and Heaven and just the few moments I saw where touching. This is a sad and can be scary for young viewers so there is a PG 13 rating. If you are looking for a fascinating, true life movie to take in 90 Minutes in Heaven is one not to miss. 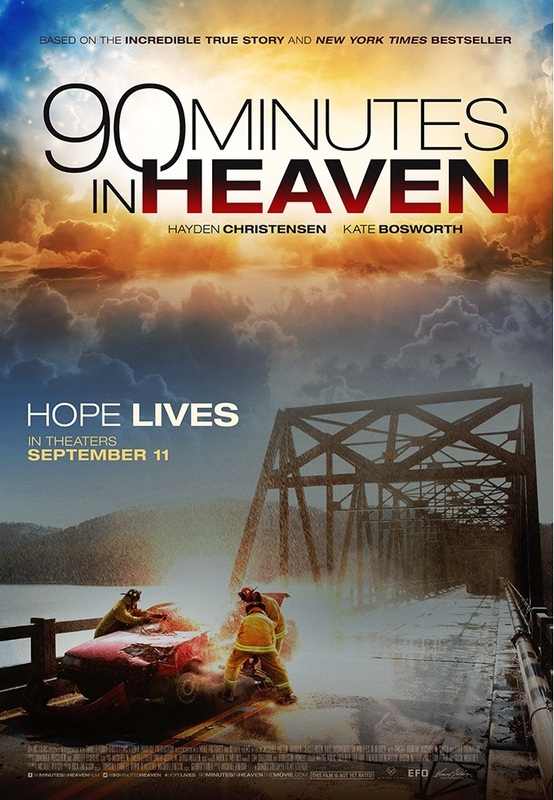 90 Minutes in Heaven was brought to the big screen by Giving Films. They are passionate about sharing hope-filled movies and donating ALL of their profits to charities and ministries who serve those in need. There first film is 90 Minutes In Heaven and they are allowing us the viewers to make a difference. Anytime you go to a Giving Films movie in theaters, visit http://www.givingfilms.com and select which charities you want to receive the profits from your ticket. Their charitable organizations are Christian Alliance for Orphans, Faith Bridge Foster Care, Hire Heroes USA, Hope International, LifeWater, Street Grace, and World Vision. I received a copy of 90 Minutes in Heaven paperback book complementary for evaluation purposes. Regardless, all opinions expressed are still 100% my own. I am disclosing this in accordance with Federal Trade Commission 16 CFR, Part 255 Guides Concerning the Use of Endorsement and Testimonials in Advertising.